Multi-Year Service Life: High-Performance Hydraulic Seal. No Damage to the Seal, after Several Hundred Uses - No need to buy Spares Kits! Compact: 2.9” Length x 1.2” Height. Ideal for Use in Small, Tight Spaces. Quick & Simple Connection. Proprietary Locking & Quick-Release Mechanism, the Coupler Locks-On and Creates a Leak-Proof Seal. 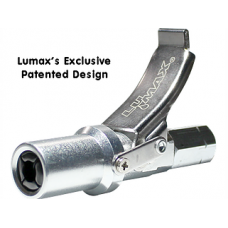 Innovative Design enables Quick Release Coupler to firmly latch onto the Grease Fitting, enabling Hands-Free Greasing. No more Fighting and Struggling with Stuck-On Couplers. If a Fitting becomes Pressurized, just Depress the Thumb Lever and Release the Coupler. No more Broken-Off Fittings. No Spurts or Splashes when Disconnecting. The Waste and the Mess are gone! A Clean Work Environment at all Times!